In making decisions “on the trail,” we never have all the information or all the time to consider it, and we definitely do not possess engines of logic in our heads. We are “only human,” to quote a favorite movie. The complicating factors fall into 2 complementary categories: factors of complexity and inappropriate decision-making short-cuts. 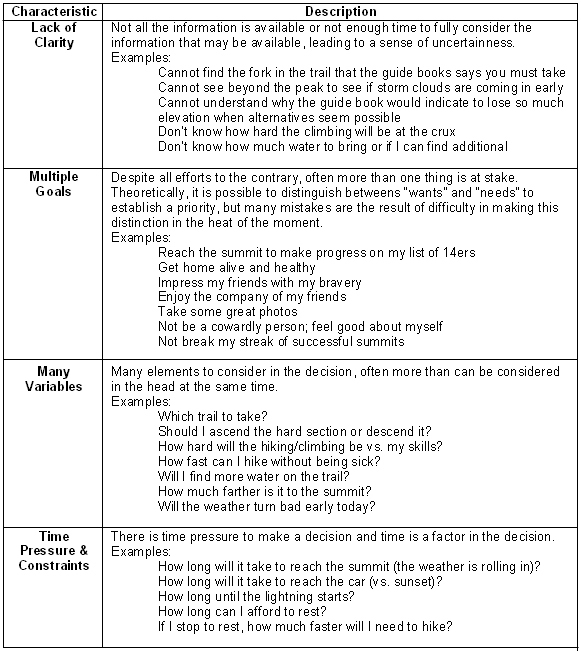 Decisions atop the high peaks nearly always involve four factors of complexity: lack of clarity, time constraints, multiple variables and multiple goals. This level of complexity is generally beyond our natural ability to deal with rationally. And we don’t have time for it anyway. Instead of getting out a piece of paper, pencil and calculator to factor the probabilities and expected outcomes, we use our intuition or unconscious reasoning skills to provide shortcuts in problem solving. Unfortunately, the mental shortcuts we humans use to aid our thinking about complex problems in our regular lives can create problematic biases in our judgments in the mountains. Even though we may not be naturally good at making complex decisions atop the high peaks, we must find a way when the plan isn’t working. By definition, decision-making is a process of first diverging to explore the possibilities and then converging on a solution. And this is what we must do when “The Plan” must change. The plan could be wrong because we planned badly (or didn’t plan) or because we didn’t actually do what we planned to do or because the team was having a bad day. Any number of things could happen, but the specific reasons only matter insofar as providing information for us to consider in our next decision. There is no time for assigning blame or even learning from mistakes, at least not yet. On the mountain with the clock ticking, we need to understand the situation, examine the options and decide on a course of action that feels good to the head and the heart. And within a Peer Group or Team, everyone must agree, and quickly. 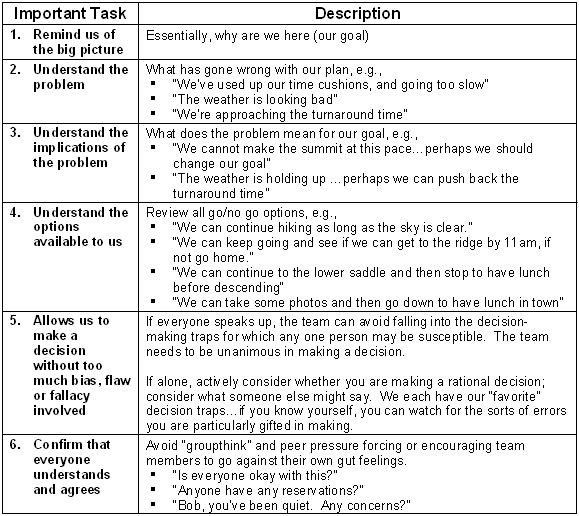 To keep us from being overwhelmed by details or being misled by the many traps, biases, and fallacies that we carry with us, and to help us develop consensus within our Peer Group or Team; we can use a simple, structured, scripted approach that allows us to accomplish the 6 important elements of making a good decision. 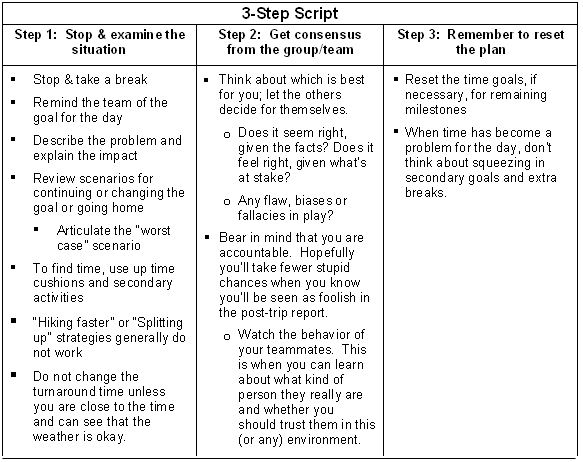 To cover these 6 elements, a 3-Step script helps us to stay balanced and move quickly to a decision. Three steps are also easier to remember than 6 elements. It looks like a lot, but it only takes 10 minutes, which can be done while on a break. And you’ll end up with a decision that everyone can live with. On those occasions when you are alone, imagine explaining the situation to someone whose opinion you respect…or fear. Note: Anyone can call for a “turnaround.” No discussion is needed or possible. If one member of the group/team thinks a “turnaround” is appropriate, then we must head back. The time to decide whether a partner is worthy of our trust is before we head into the high peaks, not after a “turnaround” is called. Consistent with this, if lightning is a clear and present danger, head for “safe” shelter immediately. Do not stop to rest or hold a lengthy discussion on the implications of the situation. “The Plan” is just a plan. We still have to do it, and, inevitably, stuff is going to go wrong. We don’t build “The Plan” because we believe the adventure will play out exactly as planned. It is because we expect setbacks and mishaps that we build a plan to provide practice, memory building, problem anticipating, and learning setup. When setbacks do occur, we use a structured approach to deal with them competently and quickly to preserve a chance to safely reach the goal.